The holidays bring both joy and stress. Am I right? 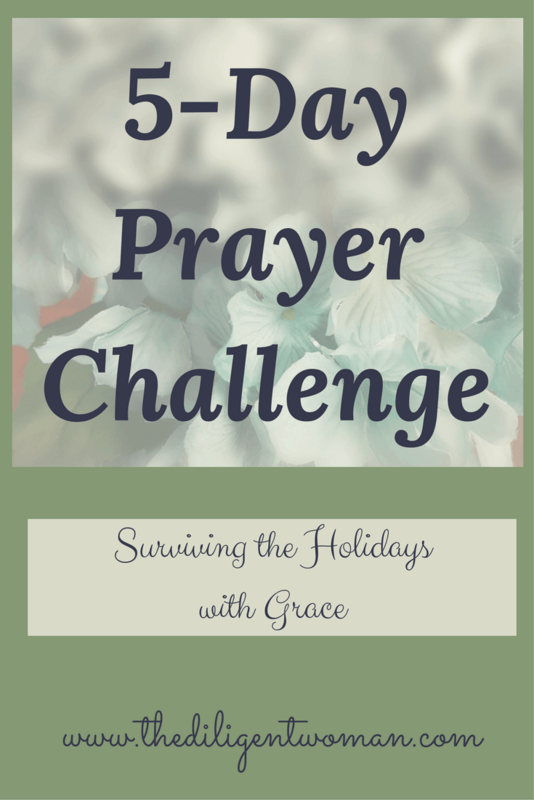 The 5-Day Prayer Challenge Holiday Edition will help to keep the stress to a minimum. and your concerns to the Lord! Join others as we work to make the best holiday season possible. “It’s the most wonderful time of the year”, sings the holiday favorite song. If it is the “most wonderful time of the year”, why does it bring so much STRESS? We are called on to do many extras. Plan for taking the entire family on overnight trips to the houses of family and friends. Spend more money. Spend more time agonizing over getting the just “right” gifts, as well as the just right amount of gifts. There are parties at the office. There are parties with friends and people from your congregation. There are parties at school or with your children’s friends from school. Spend time baking all kinds of sweet treats. Then find time to deliver them to all of those on your list. On top of that – you may be emotionally wrung out from a loss this year. You may be physically and mentally exhausted from dealing with illness, either your own or that of your family. The kids are exhausted from busy days at school and end of the semester events. Your husband is tired because of all the extra that is going on at work and stressed about the money that will be spent over the coming months. Ugh – I’m already tired and all I did was to type that list out! There are a number of answers for the stress that comes with this season. Planning is a good one. Minimizing your list is another one. But even before you do those things there is ONE thing you can do that will make ALL of it easier. Before you plan the meals and start decorating. Before the days get so full that you cannot “find” time to talk to the Creator of all things. Before your emotions get so wrung out that you find it hard to enjoy the season with your family and friends. 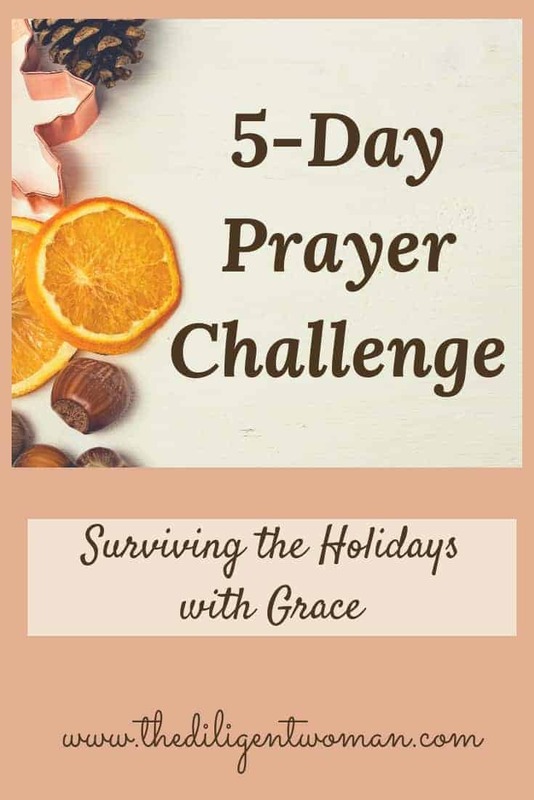 The Holiday Edition 5-Day Prayer Challenge is designed to take basic knowledge about prayer and apply it directly to the needs of this season. Join us for 5-Days of getting into the habit of talking to God BEFORE the chaos ensues. Join us for 5 Days of encouragement. God made you capable of handling difficult things. He NEVER intended that you do it alone. He intends to do these things alongside you – if you will let Him. So, get ready to be energized and zealous about talking to God all through the holiday season. Sign up below by clicking the button and sharing your email to subscribe to the daily updates. You will be sent an ebook that has a basic 5-Day prayer challenge within it, so you can understand how the challenge works. But for this prayer challenge, EACH DAY, a holiday specific prompt will be sent to your email. Apply the knowledge from the lessons in the ebook to the lesson prompt sent to you each day. It’s that simple. Sign up. Put it on your calendar. And get ready to tackle this holiday season from a position of grace thanks to the power of prayer.